Corn Poppy, (Papaver rhoeas), also known as Flanders Poppy, Field Poppy or Shirley Poppy, is hardy annual with vividly colored, papery red, pink or white blooms that rise above lacy foliage. The fuzzy stems reach heights of 2 feet (60 cm) and more at maturity. Easily grown by seed, Corn Poppies are often planted by state highway departments for spectacular displays of color along roadsides across the nation. Corn Poppies are beautiful as cut flowers and the dried seed pops add interest to dry floral arrangements. Apply a balanced liquid or granular fertilizer if newly emerging foliage has a yellowish appearance. Use the fertilizer in accordance with label recommendations. 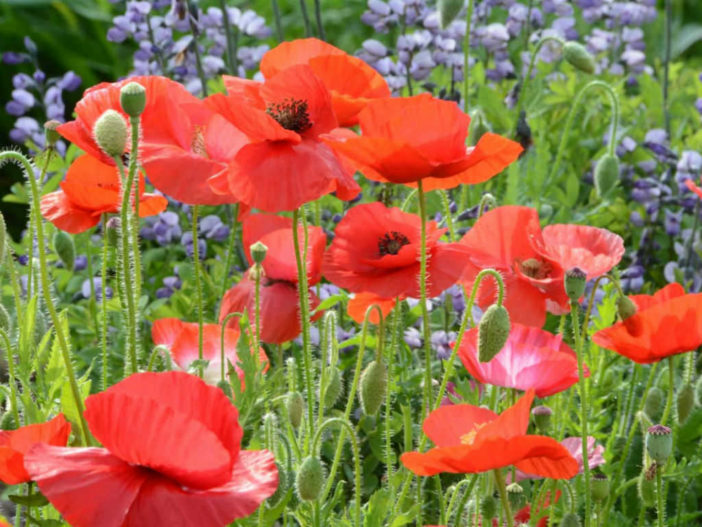 As a general rule, Poppies require no supplemental fertilization if granular fertilizer or compost are incorporated into the soil at planting time. Pinch off flowers as soon as they begin to fade. This process, called deadheading, prevents the plants from setting seed too early. Remove the bloom, along with the stem, down to the next leaf. Remove all seedpods at the end of the season if you don’t want the Poppy to self-seed. If you want Poppies next spring, allow a few pods to remain on the plants.